20110815 - Up and at the desk all day. Then back to the diamond to see Howdy's first fall baseball game. He was second at bat at hit one high and long to center-right and it dropped on getting him on base and scoring the first run/RBI for the team. They were playing a great game but JG&I had to bail out. We grabbed Doc and headed to the Gahanna Modern Day Knights dinner. We had 25 hot wings, 9 boys 7 dads, 4 large pizzas and 2 special guests. We talked to the boys about the things we remembered, feared and loved about the grades they were going into. Doc and Gene gave special talks about what it takes to make it in the world and how important school is. We reinforced to the boys that they could come to any of us with questions, for help, or any other reason. The boys all got special pencils for school and the boys going into middle school each got the book 'Man's Body' to help answer all those up coming 'questions', and a very nice walnut magnetic chess set with their names on them. 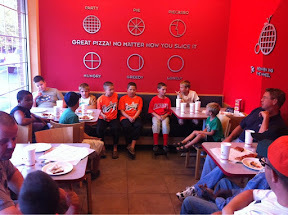 The boys enjoyed the pizza, stories and attention. After the dinner, chat and presentation we headed out to see the new Planet of the Apes movie. AWESOME! Home late, boys to bed. L at a movie with Nicole.